Kailah Trice & Jordon Holmond of Arabia Mountain HS earned gold medals. 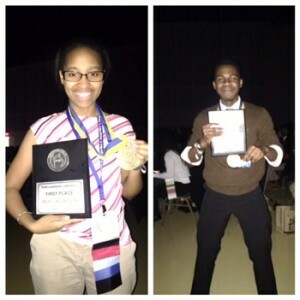 Kailah Trice and Jordon Holmond of Arabia Mountain High School earned gold medals at the Future Business Leaders of America (FBLA) Georgia State Competition held at the University of Georgia in Athens on March 12-14. They were two of five award winners from DeKalb County School District (DCSD). More than 140 DeKalb students participated in the conference. Future Business Leaders of America is one of the Career and Technical Student Organizations offered in DCSD through its Career Technical and Agricultural Education (CTAE) Department.